UNTIES has published a wide diversity of games since their inception, representing a large variety of genres. There was Tower Defense in Gensokyo Defenders, tactical mayhem in Tiny Metal, crazy VN antics in The Midnight Sanctuary and even SHMUP fun in Azure Reflections. 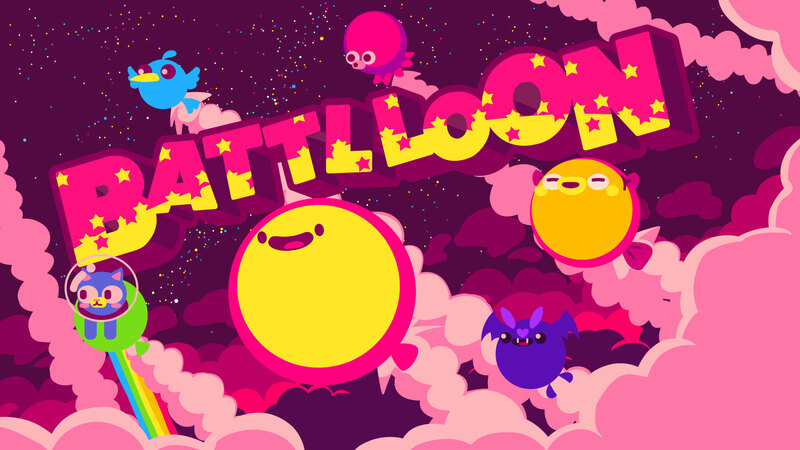 But BATTLLOON is their first foray into the world of party games. Developed by noname studio, it’s a crazy and very simple party game on PC and Switch. Was it worth trying, or should UNTIES have stuck to other genres? BATTLLOON couldn’t be simpler. There is absolutely no plot, and you play as one of the balloons (or balloon animals) whose goal is to pop the others against the spikes littered across each arena. Sound violent? I guess technically it is, but it’s very mild and candy coated violence. What makes the game a bit more interesting is how you play. You hold one face button to puff up, and after you release it you’ll shoot air behind you, giving you forward thrust. Your joystick controls the direction you’re aiming. The primary other complexity comes from the stage hazards found in each arena and how competent your opponent is. There’s a lot of different hazards, from bombs that explode in the center of the screen to comets that stun you and piranha which drag you towards spikes. Opponent competence can also vary greatly, since BATTLLOON is local multiplayer only. So you won’t ever have to test your wits against a stupid AI. While the premise and mechanics are quite basic, they do mix it up a bit. There are 6 characters you can pick from, and while it would be a stretch to say they have their own abilities, it’s accurate to say they have signature quirks. Mr. Balloon, for example, is incredibly fast when near the periphery of the arena, making him very balanced and a good risk/reward character. For contrast, take the Puffer, an enormous and slow balloon that is nevertheless capable of pushing most others around with ease. All these little quirks add a lot of nuance to the game, which gives it some much needed spice. Further flavoring the game are the delightfully colorful graphics. 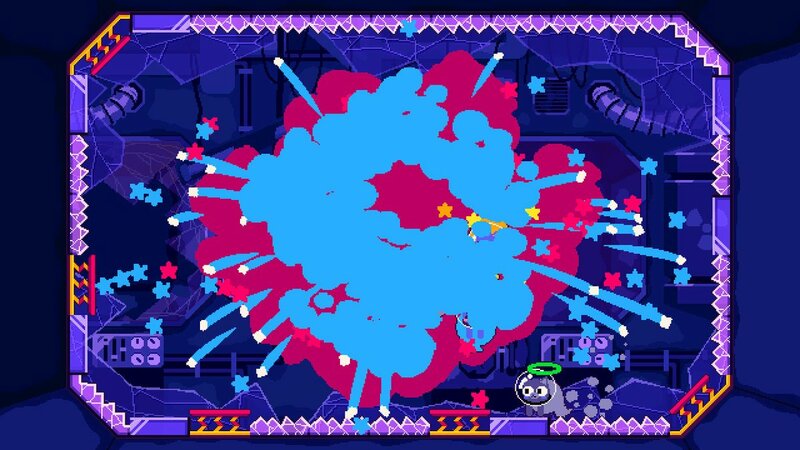 While nothing is that complex, I love the general exuberance of the design in BATTLLOON. Better yet, I never encountered any lag issues with the game, and it always ran at a steady clip. I especially loved the weird designs of the characters, such as the rainbow cloak of the kitty, the doe eyed tako and the deformed little bat creature. Musically, the game is equally basic, with only a handful of tracks. The music sounds a lot like it could have come from a SNES game, and while it’s nothing amazing, it’s also inoffensive. Altogether, the art design is one of the stronger aspects of the game. Given the basic nature of the game, it’s a good thing the controls are easy to use. A single Joy-Con controls each character, so it’s easy to play a 1 v 1 game with one friend. But while that can be fun, the most enjoyment comes from playing with more than 2 people. Though it can be a challenge to get that many friends together, I’m glad I did, since 4 player BATTLLOON is significantly better than 2 player, or even 3. There’s a quality of congenial mayhem that permeates the experience. There’s even a mechanic that’s exclusive to playing with more people, the Ghosts. Namely, if you’re playing with 3 or 4 people and someone gets popped, it’s not game over. They appear on stage as a Ghost that is still capable of pushing foes into spikes as well as smashing the walls to reveal spikes. Since it seems you get scored better for the number of times you bounce your foes against things, this can mean that even getting trounced first in a match doesn’t mean you can’t win. Regardless of how many people you play the game with, a match of BATTLLOON generally takes less than 5 minutes, or possibly up to 7 minutes. As such, I was able to encounter all the features of the game in less than an hour, spread across two different play sessions. While that may dismay some, since usually more content is always a good thing, I still think that’s fair for a game that only costs $6.99 on Switch. If you think that’s too much, I suppose you could always wait for a sale. That said, I was mostly pretty pleased with the game. It may not be the strongest UNTIES title to date, but it’s a lot of simple fun for a low price. Sure, I wish it had a bit more content, and it seems a huge missed opportunity it doesn’t have online play, but this could still be a fantastic party game when played with drinks and a group of close friends. If you’re looking for a relaxing and colorful title, then BATTLLOON might just be for you.